The National Code of Practice for Automotive Recyclers was developed by the Automotive Recyclers of Canada (ARC) in 2008 for recyclers participating in the National Vehicle Recycling Program called “Retire Your Ride” in order to standardize the process for recycling end-of-life vehicles (ELV’s) and to protect our water, air and soil from the harmful materials they contain. Given the popularity and success of the code, AARDA decided to not only continue with the program, but to expand its scope after the Retire Your Ride program ended in March 2011. 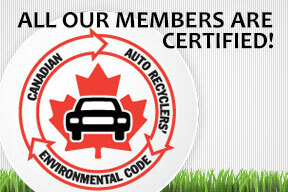 AARDA has made it a policy that any new or existing member must be audited by an independent third party and certified to meet the standards of the the Canadian Auto Recyclers’ Environmental Code. Deal with customers in a professional manner. Represent products to the public and to other recyclers as accurately as possible, particularly in terms of mileage and condition, clearly identifying warranties prior to sale. Treat customers, staff and other members of the Association with equality, dignity and respect. Operate with honesty and integrity in all financial dealings and communicate openly and reasonably in resolving conflicts that arise. Abide by laws and regulations applying to vehicle recycling. Employ recycling practices that are safe for the employees and environmentally responsible by community standards. Promote the conservation of energy and the salvage of parts that are reusable. Be a solid member of the business community and contribute to the reputation of the Association and industry. Participate in the functions and activities of the Association and where possible contribute the member’s business and professional expertise for its further advancement.